The Valdosta Tree Commission is offering Chaste trees "to citizens at wholesale prices with the hopes of planting 100 trees in the city limits", but this may actually be a bad idea, since this species is exotic, does not support local insects and birds, and in Texas has become invasive. "has no serious pest problems and attract butterflies to the garden." That first phrase is a red flag after reading Dr. Douglas Tallamy's book, Bringing Nature Home: How You Can Sustain Wildlife with Native Plants. Local insects mostly cannot eat exotic plants, and local birds eat local insects, so planting exotic trees may look good, but is not helpful to native insects and birds. Yes, Chaste trees may attract some butterflies, but how many, compared to native trees? And "no serious pest problems" means not many native insects munching on the leaves or stems of the tree. Found via VLCIA's blog, PR from Office of the Governor 11 January 2013, Forestry industry earns jobs, dollars for Georgia, illustrated here with figures from Economic Benefits of the Forest Industry in Georgia: 2011 by the Georgia Forestry Commission. And let's not forget that while paper pulp rules the roost in Georgia at the moment, there are far more jobs in reforestation than in nuclear, even more than in wind or solar. Gov. Nathan Deal today announced that a study by the Georgia Institute of Technology for the Georgia Forestry Commission shows that in 2011, economic activity generated by the forestry industry topped $25 billion in output and provided 118,459 jobs. This text amendment is part of the response to some of the questions that were raised with the additional rezoning. At the end of the day what this text amendment is going to do is to take that very outer blue color, the lightest color, which is the MAZ-3, and recommend change the zoning to 1 acre. Currently it's 2 and a half acres. He mentioned they missed the 30 day requirement to inform Moody AFB by about a week, but Moody responded anyway. Hm, that's not what he said to the Planning Commission; there he said they had allowed 31 days. Apparently it's the Chamber and Moody and the Planning Commission and the TRC all against Ashley Paulk on the Moody rezoning-and-zoning-code case, with the VDT sidling towards Paulk. The VDT claimed Lowndes County Chairman stated something that's not true according to the agenda and LAKE's videos of the recent Planning Commission meeting. And the VDT buried opposition by the Chamber of Commerce's relevant committee at the end of its article. 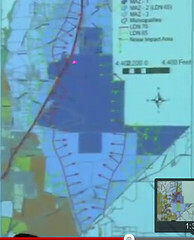 The Planning Commission's own agenda says TEX-2012-02 was proposed by "Lowndes County Board of Commissioners". And the Planning Commission voted to recommend against approving that text amendment to the ULDC. According to Planning Commissioner John Page, that vote was following the recommendation of the Technical Review Committee (TRC), which consists of staff of Lowndes County and the City of Valdosta. Page is also an incoming Lowndes County Commissioner, to take office next month. So either Paulk said something he as the Chairman of the Lowndes County Commission should know not to be true, or the VDT wrote erroneously. When you factor in businesses such as South Georgia Pecan, PCA, the Langdale Company, Shiloh Farms, Dupont, Arizona Chemical, ERCO Worldwide, Coggins Farms, Carter and Sons, and the additional farmers represented by Farmer Browns, the impact of agriculture in Lowndes County alone is one of the largest private, non-governmental industries. Across the region, ag and forestry sustain the economies of a number of counties. Many of those are obviously agricultural, but Dupont, Arizona Chemical, and ERCO? OK, I'll buy Arizona Chemical which turns pine products into adhesives and smells. But DuPont? Sure, they make chemical fertilizer, but that's like listing Chevron as a home heating company. And what's this ERCO Worldwide, which provides chemicals like caustic soda for PCA? ERCO Worldwide's other name hereabouts is Sterling Pulp Chemicals. That's right, the VDT listed Sterling Chemicals as an agricultural company! Well, that's hard to deny, because, according to FundingUniverse, Sterling Chemicals "was founded in 1986 to acquire and operate Monsanto Co.'s petrochemical plant in Texas City, Texas." Nobody can say Monsanto isn't agricultural, when 90+% of corn, soybeans, cotton, and peanuts grown hereabouts are grown from Monsanto seeds. Which is why we have so many chemical fertilizers and poisonous pesticides being used around here. Is that really the direction we want to go? On average, the sociologists found, people were having ten times as many conversations per visit. Another reason farmers markets are spreading so fast is people are paying attention to the increasing number of scientific reports that "conventional" agriculture is poisoning us, such as the recent one that demonstrates that even the inert ingredients in Roundup are poisonous or the one that links the active ingredient, glyphosate, to Parkinson's disease. Maybe they've heard about Monsanto being sued for "devastating birth defects" and chemical poisoning. And most farmers market customers seem to like fresh local foods that taste good and that support local farmers. So what if we started with those "additional farmers" that sell at Farmer Brown and Carters and Valdosta Farm Days? They are the ones already starting in a different direction. A direction that is actually more profitable, in addition to healthier (and less flooding and more wildlife). Crop rotation takes more thought and more labor (more jobs!) than just spraying, but it also takes a lot less expense on patented seeds and chemicals, for a net financial profit. Consumer demand for organically produced goods has shown double-digit growth for well over a decade, providing market incentives for U.S. farmers across a broad range of products. The USDA is talking certified organic, which has so many hoops to jump through that most local producers are not certified, yet many also aren't using a lot of chemical inputs and are using crop rotation and other organic techniques. Techniques which many old-timers around here will recognize, because they used to use them a half century ago, but with new wrinkles such as computerized records and recent research that may make them even more effective. That's right: modern organic and local agriculture is a knowledge-based industry. What has all this got to do with the colleges and SGMC and Moody? Moody could be a big customer for local agricultural produce, as could the local K-12 schools; VSU already is. Wiregrass Tech can (and already is) help teach people how to grow organic or with fewer manufactured inputs. VSU and GMC can study how that's working out, in conjunction with SGMC, which eventually will have fewer cases of some kinds of diseases to deal with. How many cases, of what kinds of diseases? There's a field of research we could lead, along with the agricultural industry to cause such improvements in health: healthy jobs from planting to PhDs! And if we do want other kinds of knowledge-based businesses and workers (which is where Silicon Valley usually gets mentioned), I think we'll find they like a place that produces local healthy foods. The VDT's first recent agriculture story started to connect the dots to building on local strengths to growing local knowledge-based jobs in Wiregrass Alley. When the Valdosta Daily Times and its sister newspapers in Tifton, Thomasville, Cordele, Americus and Moultrie decided to launch an agriculture magazine in January 2011 to be distributed across South Georgia, it was unknown how it would be received. Well, the first couple of issues were quarterly, and then due to overwhelming response and requests, it is now a bi-monthly publication going into its third year. While Valdosta may not consider itself an agriculture community, we sometimes forget just how much acreage and economic benefit derives from the ag and forestry industries locally. With a farmgate value of $70 million and more than two thirds of our entire county taxable digest in agriculture and forestry use, Lowndes County remains dependent on this economic sector almost as much as the surrounding counties, which we consider far more rural than ours. The VDT continues to congratulate agriculture as a mainstay of the local economy. It's amazing what a little investigative reporting can turn up! Now if the VDT would connect a few dots of local strengths and suggest how we could take a few tips from Silicon Valley on how to become the Wiregrass Alley of agricultural knowledge-based industry. THUMBS UP: To the region's farmers and people involved in the agricultural industry. While some may think agriculture is a thing of South Georgia's past, a Times story revealed this week that Lowndes County's farmgate has a $70 million value, making it one of the strongest private-sector industries after South Georgia Medical Center. Given the continued financial clout on the economy, we offer a green thumbs up. The "some people" would presumably include the Chamber, which made it pretty clear it considers agriculture mostly good for paving over for a shopping mall. The VDT story mentioned in the Thumbs Up was apparently not Kay Harris' agriculture alive and well, rather another one of the same day. See next post.